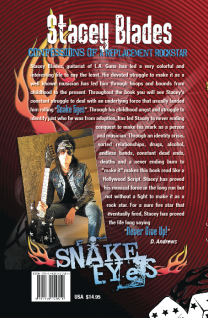 Home›Reviews›Snake Eyes: Confessions of a Replacement Rockstar - The Autobiography from Former Roxx Gang and LA Guns Guitarist Stacey Blades! 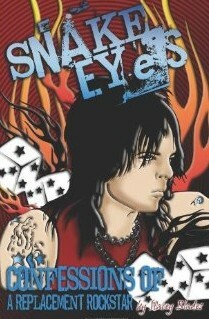 Snake Eyes: Confessions of a Replacement Rockstar is the autobiography of former LA Guns and Roxx Gang guitarist Stacey Blades. It was first released in 2009. Stacey Blades ranks amongst the most criminally underrated guitarists out there. Growing up and being exposed to music, it was not long at all before he found himself out there, pursuing his dreams of making it big in the world of rock and roll. Through many shortcomings and tragedies alike, he has forged ahead, making a name for himself, having played in bands like Roxx Gang and LA Guns. The title of this book is a reference to his struggles to establish himself in the musical world, “rolling snake eyes” and always coming up slightly short. The biggest rock stars of the past and present all seem to have their own share of stories when it comes to them making the big time, but as a fan of many of these bands, I was all the more intrigued to read a book from someone like Stacey Blades, who has had an entirely different history that has not always been massive arena concerts and platinum records around every corner. He had to forge his own path in a difficult time for rock and roll, but has finally made a large enough name for himself, making his talents known to the world. This is his story, though the best and worst of times alike. 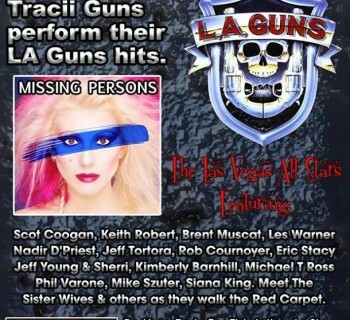 Throughout the course of this book, you will see Stacey Blades from his childhood and early exposure to music, up to recent times where he became the replacement for the legendary Tracii Guns in LA Guns (Stacey has since parted ways with LA Guns, but this book was published before he left the band). Along the way, he grows up and discovers the Sunset Strip music scene, relocates to become a part of Roxx Gang, experiences his share of drama amidst stalkers and strippers, deals with lost luggage on world tours, and eventually, through many an ill-fated venture, overcomes several obstacles and plenty of drama to take his place in LA Guns. Rear cover of the book. So how does this book hold up? This is one of the more straightforward amongst the rock biographies that I have read, and that is a compliment of the highest order. There are no confusing jumps forward and back in time on a whim like some other rockers put in their books; everything stays on the straight and narrow, and very little of it feels overwhelming or bogged down. The balance between personal drama and band business is actually done very well; for the most part you never feel like you are getting too much of one or the other. The stories throughout the book are actually handled very well, and the fact that others get to share quotes and experiences about their dealings with Blades adds to the experience greatly. At just over 200 pages in length, the book never outstays its welcome, and it will be a quick read for any fan. The photos, spanning Blades’ whole life from childhood to present day, are a nice addition as well. It is not a perfect book, and does have a few flaws that need to be mentioned. The chapter lengths tend to be inconsistent; you can be reading one that is a few short pages, and then have one that is over 30 pages. There are some typos here and there (though nowhere near as bad as I have seen in some other self-published rocker biographies); you get the impression that there was not really an editor on board and that the whole thing was entirely self-written and self-edited. The formatting suffers from a number of problems as well; at times the book is literally cut off mid-sentence by the passages where someone other than Blades shares their own stories! Furthermore, the spacing and the formatting of text is very sloppy in places. At times the narrative gets a bit bogged down by too many people involved and too much going on; the drama between Blades and the strippers he dated is a prime example of this. Still, the good outweighs the bad and no complaint is substantial enough that you should stay away from this book. Stacey Blades is a great guitarist that deserves more credit than he gets, and it is great to be able to read his life story and his journey to get to where he has been in recent years. There are some problems, mostly stemming from a lack of professional formatting and editing, but these things are minor issues in the grand scheme of things. Any fan of Blades is going to enjoy reading more about his life story. Hopefully we will be getting a second installment in the future, chronicling his post LA Guns days up to more recent times. Regardless though, Snake Eyes – Confessions of a Replacement Rockstar is a worthy read for anyone that calls themselves a fan. Recommended. 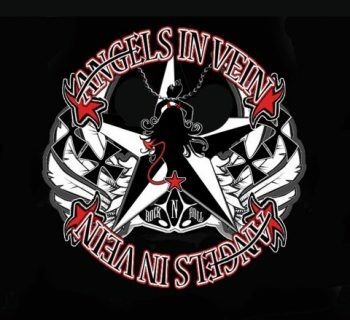 Angels in Vein - A Look at "1973," a Track From the Supergroup's Forthcoming Record!